Sigma Business Network in partnership with TrustArc, will be hosting a workshop on Digitizing & Controlling Compliance. The Event is for selected business partners and high-profile clients only and will take place on January 31st, 2019 from 14:30 to 17:30 at Crowne Plaza Athens City Centre Hotel. Participants will have the opportunity to watch TrustArc live demo, witness its unique capabilities and discuss with global field experts any questions or concerns that may have on Privacy Management and GDPR and the use of related software solution in your business. 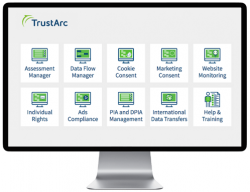 TrustArc, is the company with more than two decades of experience and global presence in providing solutions to manage privacy compliance for the GDPR, CCPA, and other global privacy regulations. Key solutions include modules as Assessment Management, Intelligence Engine, Cookie Consent Management, Data Flow Management, Website Monitoring Manager, Direct Marketing & Ads Compliance, DPIA & PIA Management and other.